In a court filled with security, John Harutyunyan listened as his guilty verdict was read. As Tuesday's guilty verdict came down against Armen Sargsyan, reaction was sharp and swift over the 15-year sentence of a man known most for having famous brothers. Political commentator of "Noyan Tapan" news agency David Petrosyan, who in March predicted that Sargsyan would be found guilty, says the verdict is politically motivated. "This is a political revenge against (opposition party leader) Aram Sargsyan, as he is a radical opposition, and has no intentions to back down. And this is a way to exert pressure upon him" Petrosyan said. Petrosyan predicts that international organizations will declare Armen Sargsyan a political prisoner. "They are ready to do that now. This trial and its consequences will create problems for Armenia,"
Armen Sargsyan was found guilty of ordering the murder last December 28 of Tigran Naghdalyan, chairman of the board of directors of the Public Television and Radio of Armenia. Naghdalyan's sister, Karine, told reporters the sentencing was not fair, but expected. Prosecutors had charged that Sargsyan was offering $75,000 to have Naghdalyan killed. His motivation, they said included the journalist "mocking" the death of Sargsyan's more famous brother, Prime Minister Vazgen Sargsyan, who was one of six government leaders murdered in Parliament on October 27, 1999. In dramatic testimony of his innocence last week, Sargsyan swore on his teenage son's life that if he should be found guilty he should face a life sentence for the crime. Sargsyan received the same sentence as confessed-killer John Harutyunyan, who testified that he shot Naghdalyan to death outside the journalist's parents' home, on the promise of getting $50,000 for the hired hit. 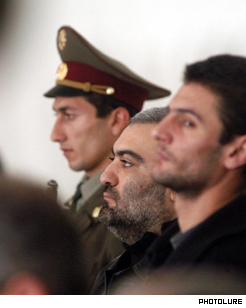 Charges connected to the murder were brought against 13 defendants, none of which -- including Harutyunyan - directly linked Sargsyan to the killing. All 13 were found guilty; six were released for time served and five others received sentences ranging from seven to 12 years for conspiracy and complicity. "No one can prove to the public that the trial was fair. One has to understand Naghdalyan's murder within the context of neutralizing the witnesses of the October 27 case. However that version was never considered," Albert Bazeyan said during a parliament meeting on Wednesday. In other words Bazeyan, the head of Republic party (to which Aram Sargsyan belongs) suggests, as many have, that Naghdalyan was killed because of information he might have given in testimony in the October 27 trial. Bazeyan invited the public and officials to meet today (Friday) at the Cinema House to discuss what he calls "legal and political sides" in both the Naghdalyan and the October 27 cases. Bazeyan called the verdict a "political decision" and accused President Robert Kocharyan of having ordered the outcome of the trial. While opposition party supporters claim Sargsyan's sentence is meant to send a message to his family (Aram Sargsyan was one candidate who stood against President Robert Kocharyan in last winter's presidential election), the victim's family were upset that the verdict was too light. Armen Sargsyan heard the court hand down a 15-year prison term. "I am completely dissatisfied by the verdict, but it was not a surprise for me," said Karine Naghdalyan, sister of the murdered journalist. "The client and the executer should serve life sentences." 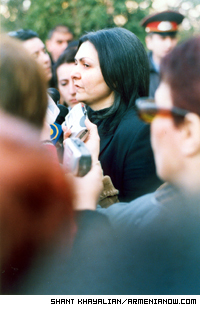 Karine Naghdalyan is sure that the murder was ordered, but expressed a doubt about Armen Sargsyan's involvement. "I am not so sure about that. I consent to the fact that he might have been an accomplice, but this does not commute his guilt," she said. Naghdalyan was asked who, if not Sargsyan, she thought had ordered her brother's murder. "I think everybody knows who the clients are, there is no need to mention names," she said. Court observers and journalists at the trial speculated on who Naghdalyan might have been referring to, but no one had a sense of who she intended in her reference. Sargsyan, himself, had nothing to say after Judge Saribek Aramyan read the sentence. 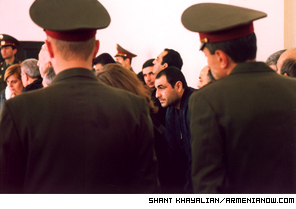 Sargsyan stood passively as the verdict was read and by demeanor it appeared that he had resolved himself to his fate. From the beginning of the hearing to the reading of the verdict, Harutyunyan, who throughout the trial had interacted with journalists, appeared upset and disturbed. Normally clean shaven, he had not shaved for his final appearance in court. He and defendant Felix Arustamyan loudly protested their sentences. In earlier testimony Arustamyan had said that they had both agreed to take responsibility for the killing in exchange for the money and on the promise that they would only have to serve eight years for the crime. "The whole process of the trial assured me that this is the only verdict we expect. Not because of the evidence, but because of the disposition (of the court)" said Sargsyan's lawyer Robert Grigoryan. Grigoryan again criticized the court for not allowing testimony that he says would have shown inconsistencies in Harutyunyan's description of the murder. According to Grigoryan, forensic research proves that Naghdalyan was shot in the nape of the neck, not from the front, as Harutyunayan said. Aram Sargsyan (who succeeded his brother as Prime Minister and served for six months) did not attend the verdict hearing but spoke out to imply that Armen Sargsyan was wrongly charged. "It was not proved in the court that Armen Sargsyan is the client of the murder. I consider this to be the most important fact," he said. "The problem is different. There is no judicial system in the country, and it would be meaningless to expect justice from a court in a country having this kind of system." Unlike his brothers, 41-year-old Armen Sargsyan has never been in politics. He is a businessman who owns shares in several Armenian companies and is head of a food processing factory. Harutyunyan, 32, of Martuni, Karabakh, is an unemployed father of four and also cares for the families of two brothers who were killed in the war in Karabakh. He served in he same unit with Arustamyan during the war. Sargsyan lawyers say they plan to appeal the verdict, adding that they have little expectation of a reversal, but that the appeal is a necessary step toward being heard by the European Court.